The American Dental Association recommends that you see your general dentist at least twice each year for a checkup. At your checkup, Dr. Pate will inspect your soft tissues for oral cancer and periodontal disease. He will also look at each tooth and search for problems like tooth decay or cracks, as well as examine old dental work. Sometimes, old dental treatment wears out and needs to be replaced. We will be happy to replace metal fillings, inlays, onlays, and crowns with tooth-colored alternatives. By looking for trouble at your regular checkups, we can often reduce your potential for large dental problems. For instance, left untreated, a small cavity can grow to damage an entire tooth and spread to the surrounding teeth. A cracked tooth can cause pain or break off and create additional problems. 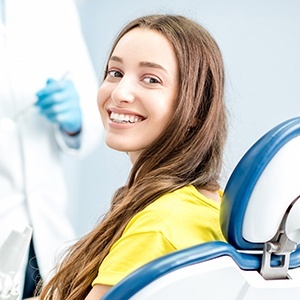 Furthermore, advanced gum disease is the primary cause of tooth loss for American adults, and oral cancer causes more than 7,500 deaths each year. Caught and treated early, all of these issues can be controlled.